With the election of Anabel Cisneros as President, Internet Society Argentina Chapter renewed last December its Board of Directors. 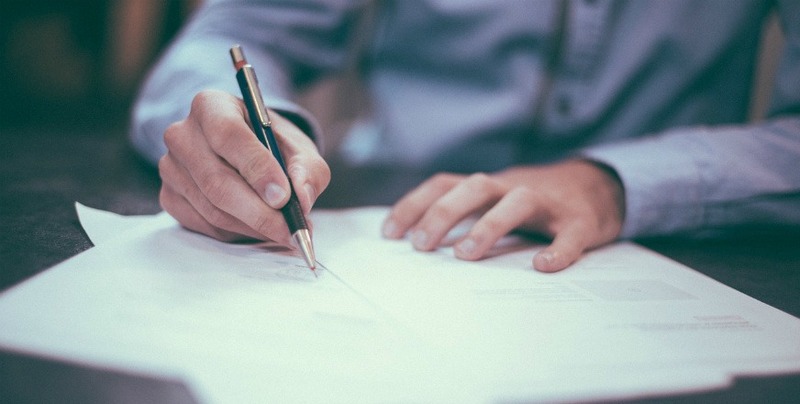 Oscar Messano and Antonio Harris, referents of the Argentine Internet Chamber (CABASE) were appointed Pro-secretary and Accounts Reviewer, respectively. On March 2, the Internet Society Haiti Chapter supported the Code9 initiative “Best Application Award”, in order to promote the work of programmers in the country. In addition, Jean Nahum Constant, member of the Board of Directors, was selected to participate in ICANN 65, which will take place from June 24 to 27 in Marrakech, Morocco. In the local media, the Chapter was covered by its activities on the Safer Internet Day in February. On March 6, Internet Society Peru Chapter held its first Update Session. 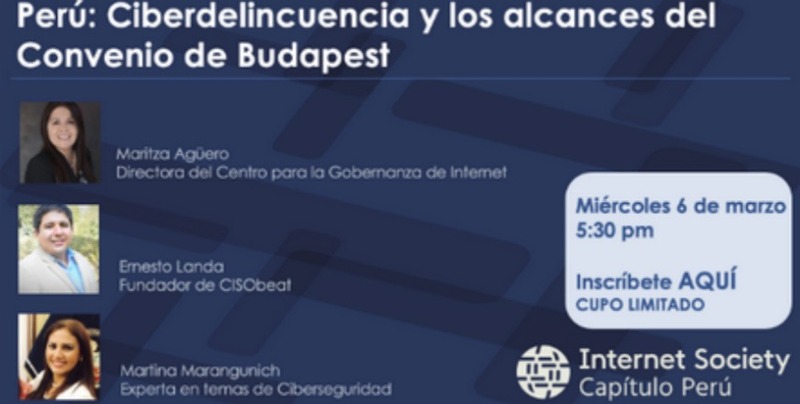 The theme was “Peru: Cybercrime and the scope of the Budapest Convention” and counted with the participation of Maritza Agüero, Ernesto Landa and Martina Marangunich. 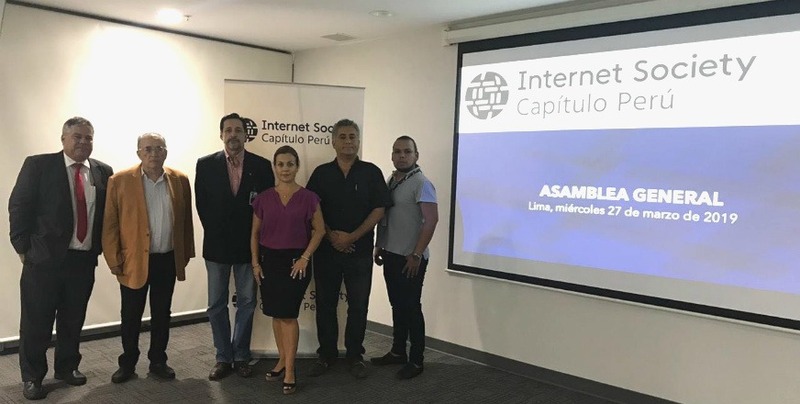 During its Members General Assembly 2019, Internet Society Panama Chapter elected the new members of its Board of Directors. The outgoing president, Edna Samudio de Jaén, presented the report corresponding to her work during her tenure. 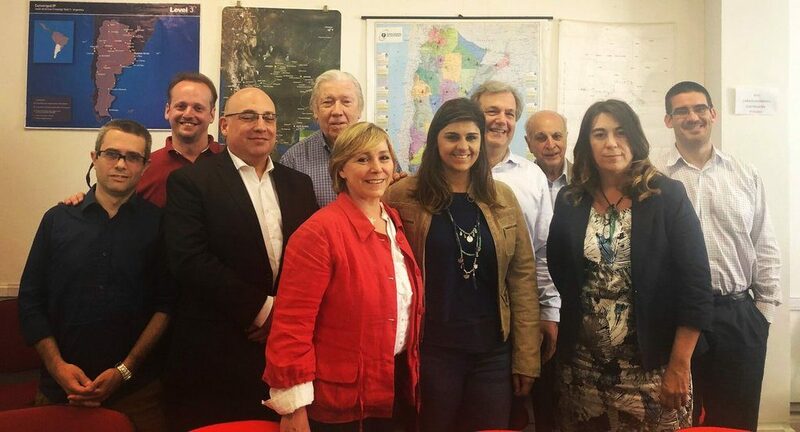 The new members of the Board of Directors are: Raúl Millán, President; Pablo Ruidíaz Morales, Vice President; Nayreth González, Secretary; Querube Urriola, Treasurer; and María Elena García, Mario Góngora and Raisa Urribarri, Vocals. 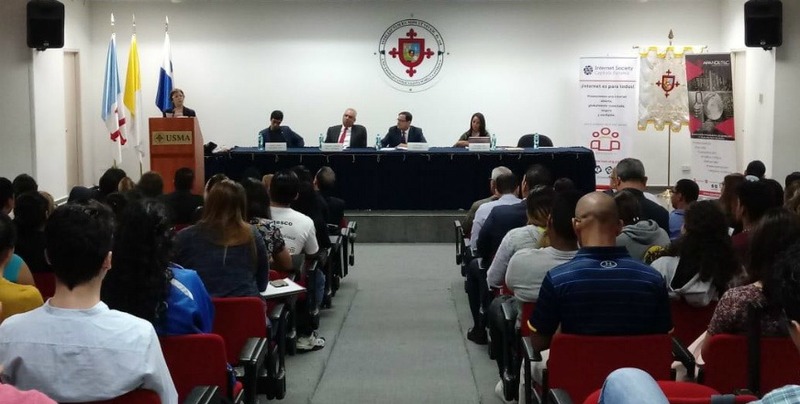 The Catholic University of Santa Maria la Antigua (USMA), the Association of Law and New Technologies (APANDETEC) and the Internet Society Panama Chapter partnered to organize the Forum “Law on Personal Data Protection: Who is protected? Which data? How? ” The event was held on March 13 and included the participation of Raisa Urribarri and André Conte. On March 13, the Sergio Arboleda University and the Internet Society Chapter Colombia signed a Memorandum of Understanding (MoU) in Bogota. This MoU aims to strengthen collaboration between the two entities for development, research and innovation in the field of Internet and its evolution in Colombia. The areas of collaboration and cooperation include, among others, the promotion of training activities and joint participation in R+D+I projects and initiatives (Research, Development and Innovation). Internet Society Mexico Chapter, in collaboration with LACNIC, NIC Mexico and WISP Mexico held the first National Wireless Internet Forum. The event took place on March 13 in Tijuana, Baja California and was supported by Konecta and Ibero Tijuana. In the forum, representatives of ISPs working in rural areas and held a dialogue with representatives of the Federal Government about broadband wireless Internet access in rural and isolated areas. The second edition of the Forum is scheduled for April 25 in Guadalajara, Jalisco. In an election held on March 27, the General Assembly of Internet Society Peru Chapter unanimously elected the new Steering Committee. The new elected officials are: Elaine Ford, President; José Antonio Casas, Vice President; Rubén Gil, Secretary; Abel Revoredo, Treasurer; Maximum Kinast, Vocal 1; and Keith Fernández, Vocal 2. Internet Society Chapter Haiti presented its program JEVAIH 2019 (Jeunes Volontaires pour l’avenir de l’ISOC Haiti, Young Volunteers for the Future of ISOC Haiti), which is focused on increasing the participation of young people in the affairs of the Chapter, giving priority to young women The program consists of a series of webinars that will be held from April 1 to 4. The South School of Internet Governance 2019 will be held in Mexico City from May 13 to 17, in collaboration with the Internet Association MX. The discussion in social networks can be found in the hashtag #SSIG2019. The Puerto Rico Chapter, in collaboration with ICANN and the Hispanic Educational Technology Services (HETS), celebrated the “Fall in love with the Internet” event on February 15. The topics addressed were functioning of the Internet, the composition of its ecosystem and the mechanisms of participation. 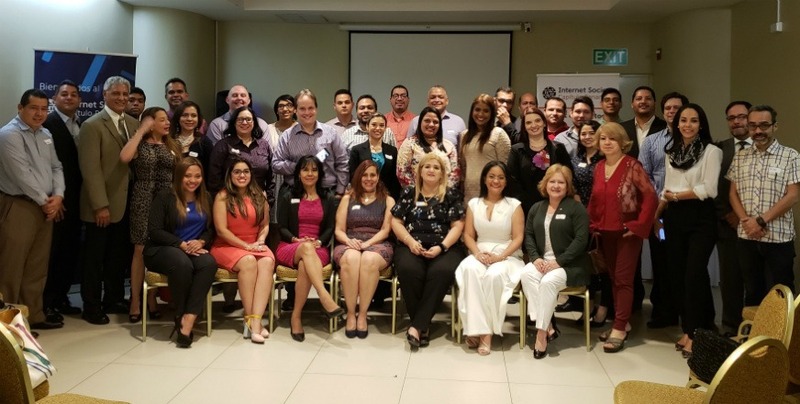 In addition to the chapter members, Nancy Quirós also participated in her role as Chapter Development Manager of the Regional Bureau for Latin America and the Caribbean of the Internet Society. 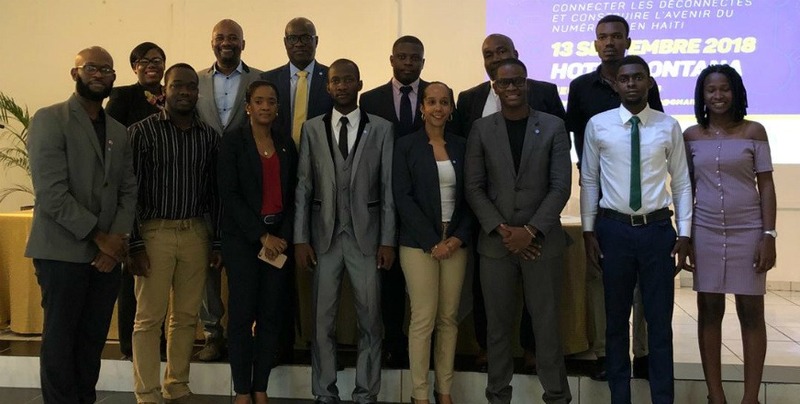 Tracy Hackshaw and Niran Beharry, members of the Executive Committee of the Trinidad and Tobago Chapter are part of a group of experts convened by the Trinidad and Tobago Bureau of Standards (TTBS). The group will review the national adoption of two ISO standards related to information security. On January 21st, the Puerto Rico Chapter held its first 2019 meeting, during which the new Chapter officers were elected. The Board of Directors members are: Norberto Cruz, President; José R. de la Cruz, Vice President; César M. López, Treasurer; and Miguel Vélez, Secretary. Eduardo Díaz will be the Chapter representative to the ChAC. In addition, as members of the Board were elected Alfredo Calderón, Miguel Bauzá, James Lynn, Lenis Torres, Barbara Ann Ortiz, Denisse Rodríguez and José Pabón. On the occasion of its 23rd anniversary, the Mexico Chapter will hold a cycle of conferences on various topics. The first one took place on February 12 and focused on MANRS. Taking into account the existence of security incidents on the Internet, a multistakeholder group of members of the Mexico Chapter allied with more than 65 people to share knowledge and experiences, make synergies and support the strengthening of cybersecurity objectives in the country. In the future, the Chapter visualizes the conformation of specialized working groups. More information with Julia Bernuy at bernuy@unam.mx. As part of the projects initiated during the Workshop for Chapter Leaders in the region, the Panama Chapter held a virtual seminar dedicated to the multistakeholder model. The activity, designed by the Chapter Executive Council, was open to the entire community of the LAC region and was held in Spanish on February 16. The Colombia Chapter, in collaboration with the Universidad Externado de Colombia, has designed a free course in Spanish on Internet Governance, which is available on the MiriadaX platform. The course lasts 4 weeks and has started on February 18. Welcome to the Colombia Chapter! The creation of the Colombia Chapter was officially announced on 6 December 2018 at Universidad del Rosario, in Bogotá. The Chapter encouraged the need to generate programs, projects, and initiatives for social development in Colombia supported in the massive access and use of the Internet. The Ecuador Chapter took part of the National IGF meeting in the country, on November 10, 2018. A video message from Raul Echeberría, Vice-President of Global Engagement of Internet Society was shared during the Opening Ceremony. The conversation in social media was carried out under the hashtag #IGF2018Ec. On November 2nd, the Puerto Rico Chapter partnered with Hispanic Education Technology Services (HETS), Dot PR and the Inter-American University of Puerto Rico, Campus Aguadilla to carry out the Internet Day celebration in Puerto Rico. A short video can be found here. 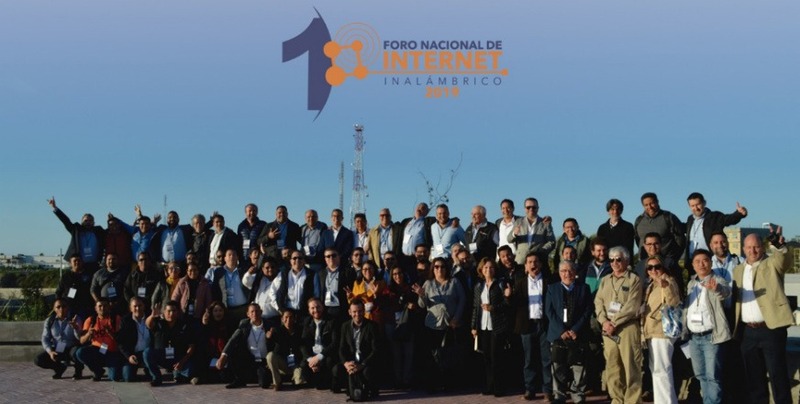 The Paraguay Chapter took part of the Fifth National IGF in Paraguay, carried out from 6 to 9 November, 2018. Several Chapter members took part of diverse activities during the three days of the meeting. The event was well attended by participants onsite and online through YouTube. Some members of the Peru Chapter took part of TechCamp Peru, a regional workshop focused in the use of technology as a tool to fight the crime in the Latin America and the Caribbean region. The workshop was carried out from 7 to 10 November 2018 in Peru and counted with the participation of people from Bolivia, Brazil, Chile, Colombia, Ecuador, Paraguay and Peru. The Nicaragua Chapter partnered with the SIG Women, Wikimedia Foundation and the Centroamericana University to offer a workshop on basic Wikipedia edition focused on women teachers of Nicaragua. The event was carried out in November 17, 2018. Several members from the Latin America and the Caribbean Region took part of the 13th meeting of the IGF, which was carried out from 12 to 14 November, in Paris, France. Some of them had the opportunity to moderate sessions and to take part of the conversations during the diverse sessions of the meeting. 2018 has been closed in Bolivia with the celebration of the second National IGF meeting. The event took part on 5 and 6 December. ISOC Argentina and the University of Palermo organized the open talk: “Wireless and mobile communications. Yesterday, today and tomorrow “, with the visit of Dr. Katz from the University of Oulu, Finland. Christelle Vaval and Jean Nahum Constant, two members of the Board of Internet Society Haiti and the ICANN fellows attended the ICANN 64 meeting in Barcelona. On the other hand, the second edition of Haiti Cyber Con was held on October 20 and 21, two days of conferences on cybersecurity. In addition, the Chapter is carrying out Smart Class, an IoT project in the country. It seeks to promote the IoT and its security in Haitian schools. On Wednesday, October 24, the Peru Chapter held its second bi-monthly Webinar. 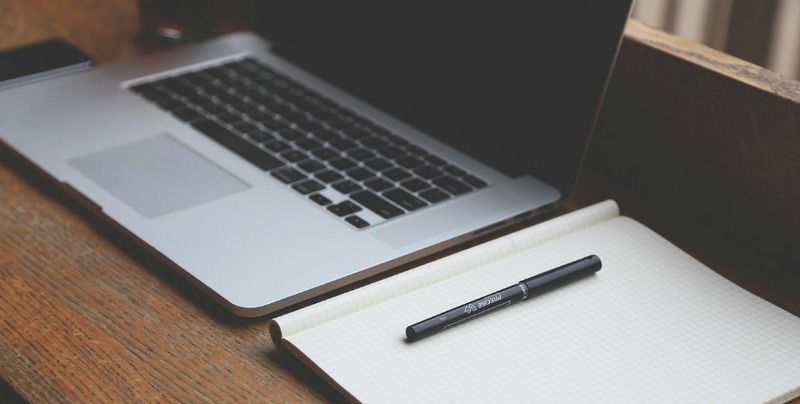 These webinars are an initiative that seeks to decentralize the work carried out by the Chapter, facilitating the participation of people who can not be present in Lima, but who work or have ideas related to the development of Internet in the country. On this occasion, the guest was Elisson Diones Cazumbá, President of the Internet Society SIG Youth, who spoke of the work he does and provided an opportunity for young people in the community to exchange experiences with him and ask him questions of interest. The Peru Chapter collaborated with D & D International – Digital Democracy to carry out the Fourth National Digital Democracy Meeting. The event was held on September 20 in Lima, Peru, with around 40 speakers, including six candidates for mayor of Lima. The event aroused great interest and attracted a well-attended audience throughout the day, reaching up to 400 people. The streaming reached more than 18 thousand people. It is worth mentioning that during the day, the hashtag #DemocraciaDigital held the first place among the trending topics of Twitter.